On April 25, 2015, a major earthquake occurred in Nepal. This magnitude 7.8 quake was centered in northeast Nepal and was felt from Mount Everest to Kathmandu. It killed over 9,ooo people, injured at least 22,000 more and left thousands of people homeless. The traditional unreinforced stone and mortar construction in rural villages and the old brick and mortar temples and stupas were no match for the shaking of the earthquake. Fortunately none of our colleagues and friends were injured and none of our study sites were significantly impacted. The humanitarian crisis was immense. 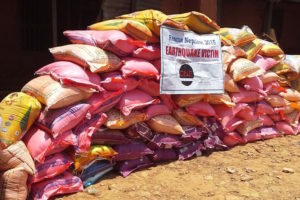 GNE had the resources and connections in Nepal to assist in earthquake relief efforts. Narayan Bhandari was our leader in Nepal. GNE provided financial aid from our gracious donors. 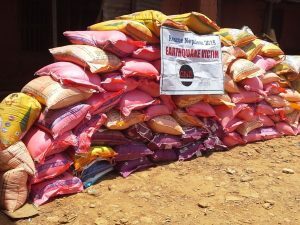 Narayan initially delivered emergency food and tarps to damaged villages. Once larger aid organizations were able to move in, he turned to construction of temporary schools for displaced children. A total of 23 replacement schools were built from salvaged timber and corrugated metal panels over the next several months. In February, 2016, Dr. Long returned to Nepal on a fact-finding mission and met with Narayan and local representatives. 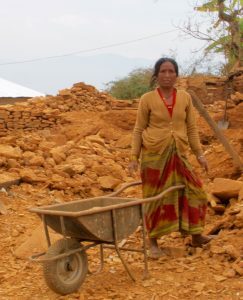 From her observations and their requests, the GNE board decided to use our funds for earthquake relief to aid two villages in construction projects. 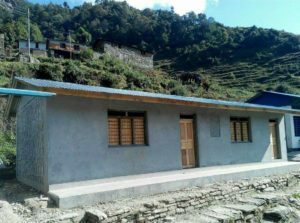 A permanent school addition was built in Thadakani and a community development center in Bhotsipa. These projects were completed in 2017. They will be available to use for our ongoing education programs to benefit women and children.